Something about this playground REALLY bugs me. LOL Sorry, couldn’t resist. This bug-themed playground is the much-anticipated replacement to the old wooden playground next to the Splash Pad on First Lake Drive. We’ve been watching it closely since we were surprised to come upon a construction site one day last fall have been eager to see what the new play space looked like this spring. I really love the bright colours and whimsical style of this playground. It fits in nicely with the colourful splash pad adjacent to it. This giant fly is the creepiest!! The big kids section has a bug theme with a giant fly to climb on and a series of ants to hop across and climb up the side of the structure. One challenge I immediately noted however was that there was no “easy” way to get to the top of the structure, all were quite difficult. This didn’t stop my kids from tackling it, but more timid children, or bolder children who aren’t ready, could struggle with this climber. Those who love to climb however will be thrilled with the options presented here! They also have some cool belt swing/hammocks that were fun to lounge on and close enough to the ground to roll out of unharmed. They also looked like they might be a good option for a child who needs mobility support to ease into from the lower position, but I’m not sure on that as there is no back support. The toddler section has a double slide and picnic table in the shade underneath. Various climbers provide options to get to the top, but they also have a simple ladder for the smallest of players. This area has all sorts of animals featured from pond dwellers to safari creatures and a cute ground-level animal memory game for kids. It’s nice that it’s set back a little from the big kids area so they little ones are less likely to get run over by them during play. There is one swing set that includes two belt swings (that are pretty low to the ground so tell your long legged kids to keep their feet up! ), a baby swing and a nifty baby/big kid or adult combo swing. There is also a wonderful splash pad right beside it that is open during the summer, and it sits on an amazing network of trails for biking or walking and a pretty duck-filled lake (that is regularly closed due to bacteria so proceed with caution). Overall it’s a great improvement and aesthetically fits the space. We’ll miss doing laps on that old wooden structure but I’m sure there will be years of fun climbing on the giant bugs! 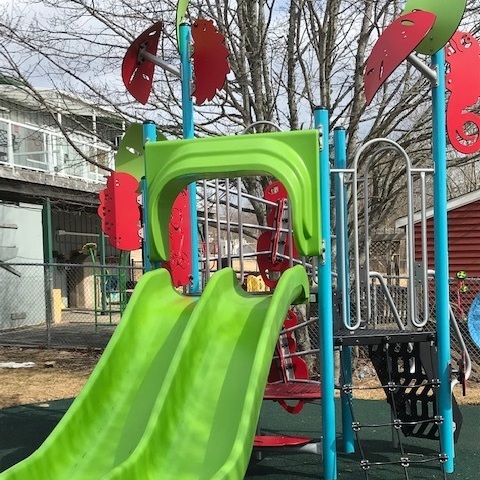 The Sackville Kinsmen Playground is located at 71 First Lake Drive in Lower Sackville next to the Kinsmen Splash Pad and across from Sobey’s. There is a parking lot right off the road however be cautious as it’s fairly narrow so keep an eye out for other cars and children. There is a set of stairs and a flat paved path down to the playground which makes it accessible to all mobility levels. Two play structures; one for the bigger kids, one for the toddlers. Many climbing options including rock walls, ladders, spider web ropes, etc. No fence between playground and the road, but it's set at the bottom of a hill a bit of a distance from the road. Keep an eye on kids though as First Lake Drive is a busy spot and there is a lake on the other side of the playground. Closest public bathroom is at Sobey’s but in the summer there are port-a-potties on the other side of the splash pad. Splash pad open during the summer months; lake swimming available during the summer (but frequently closed for bacteria counts so check ahead of time). A small snack shack is open during in the Kinsmen building beside the playground during the summer with food like hot dogs and chips, and, of course, cold treats like ice cream and popsicles, at very reasonable prices. There is a convenience store and Sobey’s across the street year-round. Sackville Lakes walking and biking trails connect to the playground.